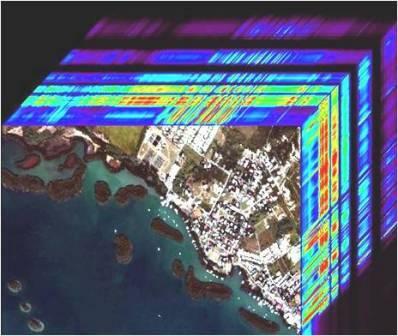 Some of the research being conducted at the Bio-optical Oceanography Laboratory of the University of Puerto Rico, Mayaguez Campus, involves field measurements of apparent and inherent optical properties of the water column in both coastal and oceanic environments. 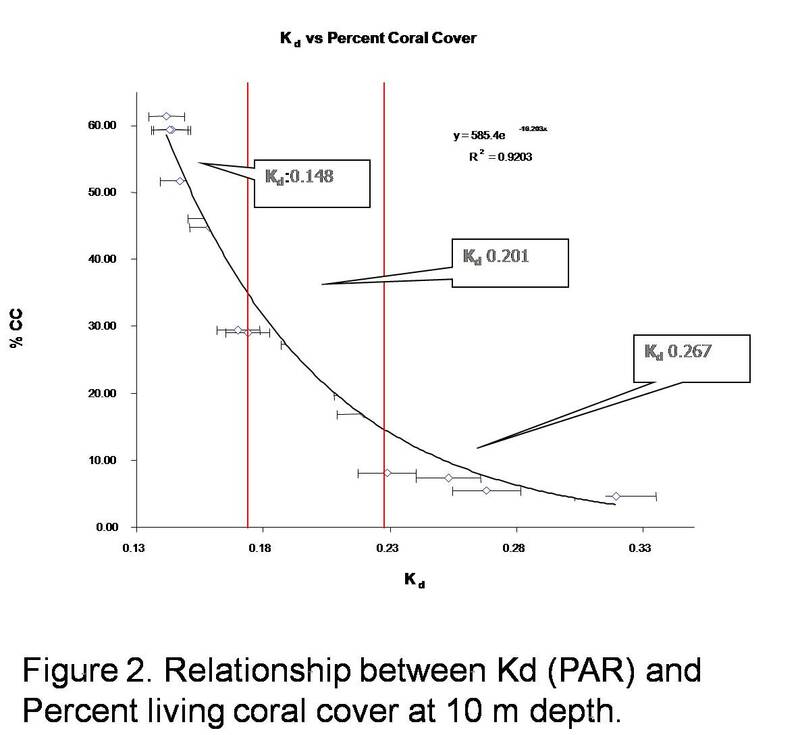 There is little information on the relationship between the incident spectral flux and the diversity, community composition, and health of coral reefs. There is a need to ascertain how gradual or drastic increases in water attenuation coefficients (Kd) serve as change indicators for these communities and their predictive value. The Kd coefficient is expressed logarithmically as the rate of change of the downwelling irradiance with variations in depth. 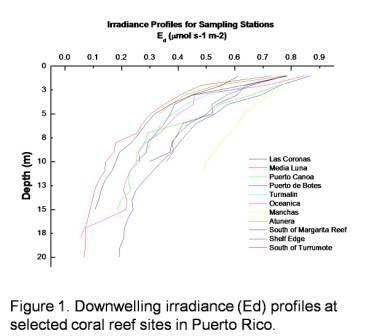 Downwelling irradiance (Ed) measurements were conducted in the field at 24 sites displaying a wide range of coral cover but at a constant depth (Figure 1). 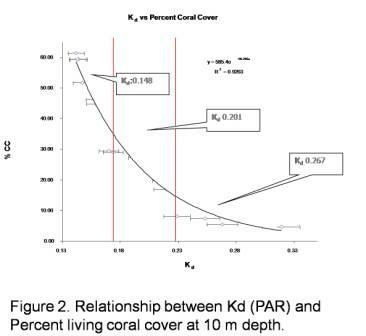 These Ed profiles were used to derive Kd (PAR) values, which varied inversely and were statistically related to percent living coral cover (Figure 2). 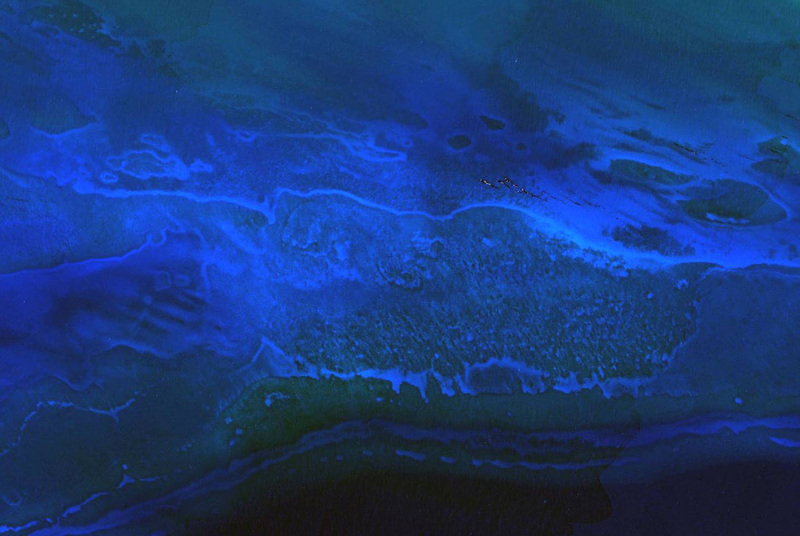 Phytoplankton strongly influences the optical properties of natural waters. Optical methods are well suited to assess harmful algal blooms (HAB’s). We have used the GER-1500 and the Satlantic HyperPro spectroradiometers to derive remote sensing reflectance curves (Rrs) which are used to detect and quantify phytoplankton groups, including HAB’s. From the downwelling irradiance (Ed) profiles of the Satlantic we can also calculate the spectral attenuation coefficients (Figure 3). The dinoflagellate Cochlodinium polykrikoides (Margalef) has been identified as a potentially ichthyotoxic organism distributed through warm temperate and tropical waters. Blooms of C. polykrikoides (Figure 4) have been recurrently observed in Bioluminescent Bay since 1958. The optical properties of these organisms are being studied in the field and under pure culture conditions to develop a methodology for their detection using remote sensing. We use underwater Rrs measurements to create spectral libraries of coral reef organisms in support of airborne hyperspectral remote sensing. In addition, underwater Rrs data are used for water column corrections of AVIRIS data using “flat-field” calibration targets (Figure 5). 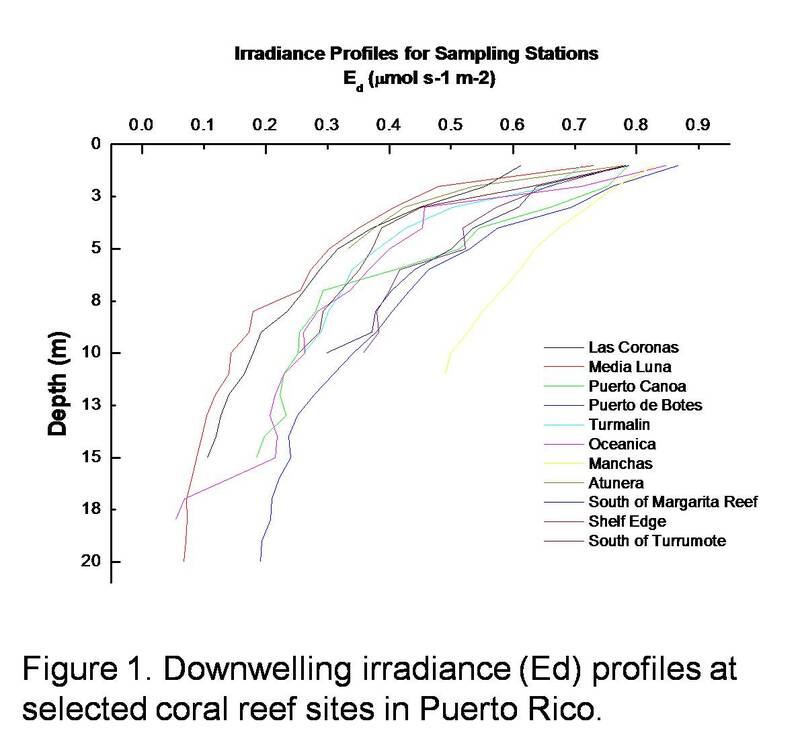 Our main goal is to create a benthic map of La Parguera to study the impact of the 2005 coral bleaching episode in Puerto Rico and to map the distribution and condition of the threatened Acropora species (Figure 6).